Offering free parking and free WiFi, Hotel Yehuda is on Jerusalem’s Massuah hill slope and feature elegantly furnished rooms and a semi-Olympic sized pool. 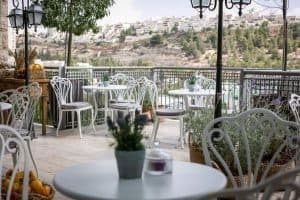 Israeli buffet breakfast is included at this hotel, set a 15-minute drive from central Jerusalem.Room service, a Kosher restaurant and games room are featured at the hotel, which also has a supervised children’s play area, a garden, a synagogue and a gym. Meeting and banquet facilities and a gift shop are also available. All rooms offer a flat-screen satellite TV, air conditioning, coffee and tea facilities and a kettle. Each room includes a private bathroom with hairdryer and toiletries. Extras include a desk and a laptop safe. Sessions in the spa, counting 4 treatment rooms, a hot tub and both wet and dry saunas, can be booked on site. The hotel is 300 m from the Tisch Family Zoological Gardens and 1 km from the Biblical ZOO Train Station. The Ein Kerem neighborhood is 5 km from the property, while the Biblical ZOO is 1 km away.